Firmly founded, Alma mater, ever true we'll be. Here within your halls of learning pledge we loyalty. 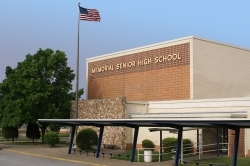 That we'll always shield and cherish Memorial High School's name. For our red, white, and blue. Memorial, Memorial, until the day we die. To those who may deny. Memorial, Memorial, forever we'll live on. I believe in the United States of America as a Government of the People, by the People, for the People; whose just powers are derived from the consent of the governed; A democracy in a republic, a sovereign Nation of many Sovereign States; a perfect Union, one and inseparable; established upon those principles of Freedom, Equality, Justice, and Humanity for which American Patriots sacrificed their Lives and Fortunes. I therefore believe it is my duty to my country to Love it; to Support its Constitution; to obey its laws; to Respect its Flag; and to defend it against all enemies. The Creed was written in 1918 by William Tyler Page of Friendship Heights, Maryland in the course of a nationwide contest on the subject. Page was a descendent of President Tyler, and Representative John Page, who served in the Congress from 1789-97. William Tyler Page began his government career as a Congressional page in December of 1881. In 1919, he was elected Clerk of the House of Representatives, and held that position until December of 1931. a new post, Emeritus Minority Clerk, was then created for him which he occupied until his death on October 20, 1942.